The winning research project for last year’s Dairy Industry Vet of the Future Award looked at antibody levels in colostrum. Laura Bowyer finds out more. Antibody intake has a clear effect on calf growth rates, according to Sam Bowker, vet at Willows Veterinary Group, Cheshire, and winner of the Dairy Industry Vet of the Future, an annual award presented at the Dairy Show. 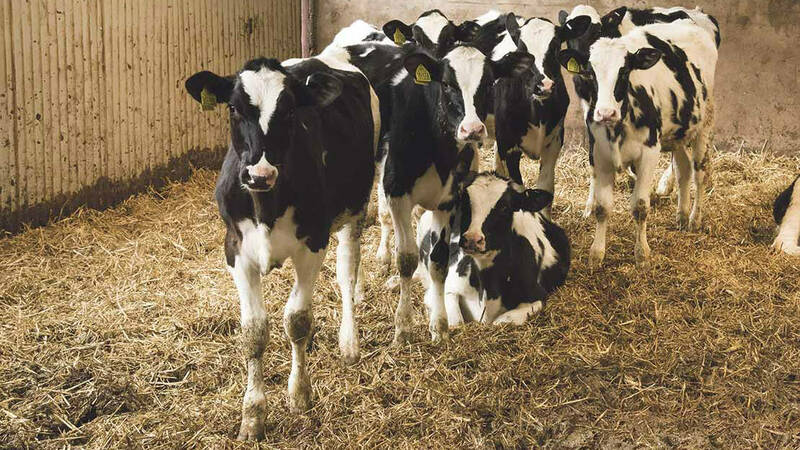 Heifer calf management is often overlooked on dairy farms, which Mr Bowker says is surprising given heifers are usually the most genetically valuable animals in the herd, and colostrum intake is key. He says: “Good colostrum management has long been known to be essential in calf management – there are lots of studies linking passive transfer of antibodies in colostrum to disease in calves, particularly scours and pneumonia. There is also an increasing evidence base showing early-life factors, including pre-weaning growth rate, are important in determining the future productivity of heifers when they enter the milking herd, including milk production, fertility and longevity. Mr Bowker says it is therefore all the more important to get heifer calves off to a good start to maximise lifetime profitability. He was nominated by Cambridge University where he studied, with his final-year project which examined how antibody levels from colostrum affect growth rates in pre-weaning dairy calves. Mr Bowker says he chose his project subject because of a particular interest in youngstock, having been responsible for calves growing up on the family dairy farm near Exeter. In the study, 86 dairy heifer calves from three farms in Devon were blood sampled between two and seven days old for serum total protein values to assess antibody levels in blood, received from colostrum. Mr Bowker says: “Results showed if calves had an antibody level of less than 4.8g/dL, they grew significantly slower; at 130g per day less than those with an antibody level of more than 4.8g/dL. “This level is around the commonly accepted cut off for failure of passive transfer of 5.2g/dL. “The likely reason for this finding is calves which fail passive transfer, so those which are not receiving enough antibody from colostrum, are more likely to develop disease. The study also found if a calf had an antibody level much higher than 4.8g/dL, for example 7.2g/dL, it did not appear to grow any faster than a calf with an adequate but lower level of antibody, such as 5.8g/dL. This is because the antibody level does not seem to have a direct effect on growth rate once a calf has received enough to prevent disease. Mr Bowker says: “Practically, this study reinforces the need for good colostrum management, as it is essential dairy heifer calves receive enough antibodies from colostrum to enable them to grow in the pre-weaning period. The study showed the value of measuring antibody levels to assess effectiveness of colostrum management and passive transfer. Mr Bowker says farms on the study were fairly happy with their colostrum management before the study, but were surprised at the number of calves which had not received enough antibodies. He says: “Without measuring, it is difficult to know for sure calves are getting enough. Blood samples can be quickly analysed to check whether the current farm protocol is working – it would be worth speaking to your vet about this. Since starting work post-graduation, Mr Bowker says he has loved his first year in practice. He has been exposed to all aspects of farming, from surgery to herd health, but has also been able to continue his interest in youngstock. He has noticed a number of farmers are rearing calves fairly well up to weaning, but says a large number of calves experience significant checks in growth rate in the post-weaning period – the transition from a milk-fed calf to a ruminant. With this in mind, the Willows Veterinary Group has enabled him to start a project looking at growth rates around weaning. Building on his final-year project, dairy heifer calves from two farms are being blood sampled between two and seven days and weighed every four weeks up to 16 weeks old. Mr Bowker says: “This will allow analysis of longer term effects of antibody levels from colostrum. Previous Article Succession: Have you had 'the conversation'?